Okay, I know that I said that I wouldn’t further neglect the much neglected TTK, particularly for the (very poor) excuse of not liking my kitchen. Well, I have a good excuse for having done so lately and it involves spending an entire week being able to stomach nothing but cereal. Yep – I’m up the duff. Thankfully, I seem to have passed into the second trimester mostly unscathed and am starting to feel significantly more like eating food that is, well… not either cereal or tomato sandwiches. So, I’m going to try and begin again in earnest. Particularly now that I can start thinking about what kinds of wonderful wholesome foods I need to put into my body now that I’m growing a tiny human. Add to this the fact that we are moving (hooray!) and our new place will have a kitchen. I don’t just mean some stock bench-space, a hob, an oven, a sink. I mean an entire room devoted to cooking. A whole room – with some wonderful bench space – that I can lock myself into and devote to food creation. And to celebrate, here is something which is specifically for my friend B. While she was still living in London we talked about how to create something like this and I said that I would organise some kind of recipe for her. Of course, I never did – but here it is. – slightly overripe tomatoes. 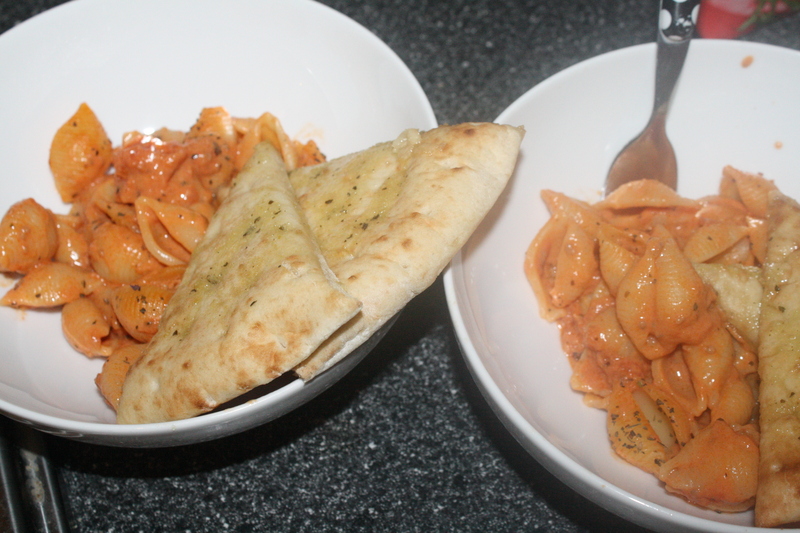 I used cherry tomatoes for this, but you can use any kind. Skin your tomatoes. The easiest way to do this is to cut a little cross into the bottom side of each tomato and submerge it in boiling water. Once you pull it out you should be able to just peel the skin away – if not, just dunk it back into the water. 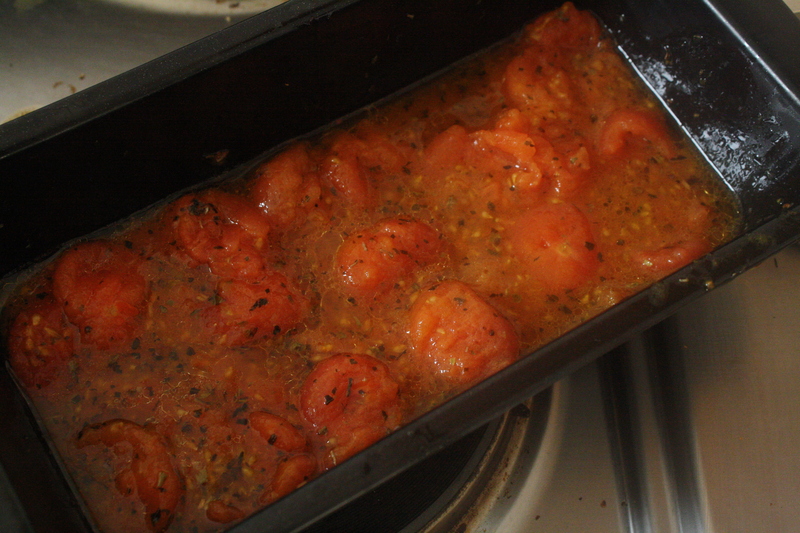 Put all your tomatoes, along with a little drizzle of olive oil, into an oven proof dish. If you’re using big tomatoes then cut them up into quarters or eighths, cherry and baby tomatoes you can just put in as is. Put them into a moderately hot oven, something around 200 should be fine. Leave them for about half an hour. Pull the dish out and smush them up with a fork. Be careful! You might get squirted with some very hot tomato seeds and other assorted innards. Smush as much as you can. Pop them back in the oven for another 15-20 minutes. 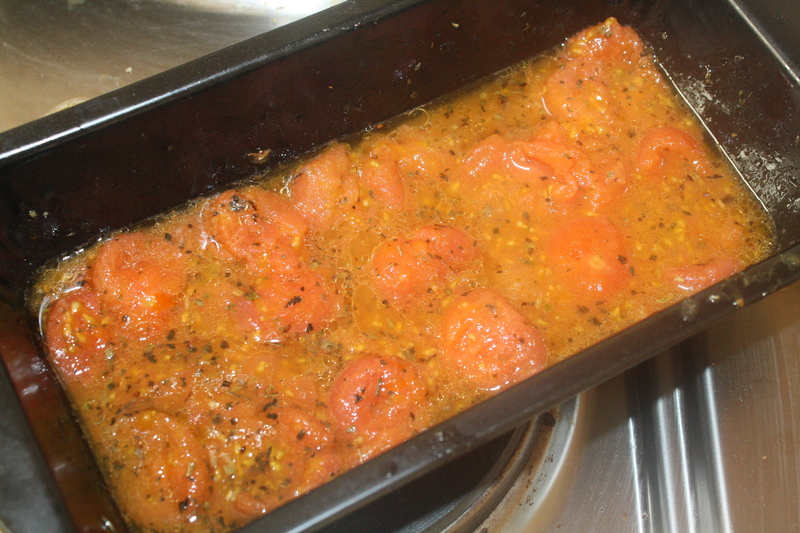 At this stage, I like to transfer the tomatoes into a pot and put them on the stove – covered – to simmer down a bit more. This is also a good time to add in some chopped up fresh (or dried, if you like/that’s all you have) herbs. This stage is a bit more up to you. If you don’t mind a chunky sauce, you won’t want to leave them simmering for too long. If you want something a bit smoother you will want to cook them down a little bit more. If you are so inclined you can wizz your sauce up for something a little bit smoother. Now – you can either use this sauce as is. Or, you can add things – soy milk, cream, cheese is fine, if you are so inclined you can add some cooked brown lentils or TVP to make something closer to a bolognese. At the ‘transfer to the pot’ stage you can start by adding some finely chopped onions or leeks, carrots or celery also go really well. Before you finish, throw in a dash of red wine for something a bit richer. You can really do anything you like with it. It’s also freezable, so you can make a huge batch and freeze it off. There comes a time in every person’s life in which they must attend a formal occasion during which food of some kind will be provided. Many people experience anxiety over these events, mainly based around the common question of ‘what if I get something I don’t like?’ For the vegan, this anxiety revolves mainly around the question ‘am I going to get something that is a) edible, and b) not a stack of roast vegetables with nothing on it and c) am I going to get dessert that isn’t fruit salad?’ (I must say, I think that the whole thing is less anxious for the vegetarian, who is usually assured of receiving something smothered in cheese and, therefore tasting only of cheese). Well, last Sunday I attended my first ever wedding in which I was not the bride. At my own wedding, one year ago (in three days!) 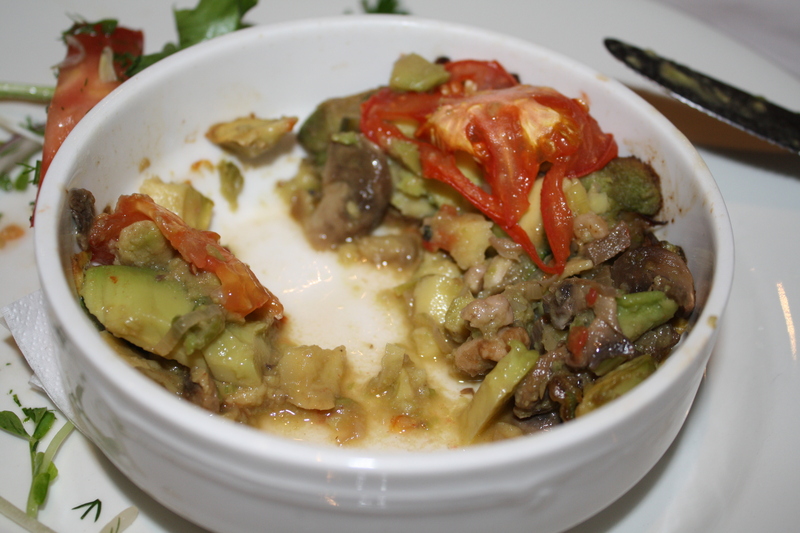 I did receive a stack of beautifully cooked vegetables in a very lovely roast tomato sauce, but I ate so little of it that it didn’t really bother me too much. And, I don’t even remember what the entree was, so that shows you how much attention I paid. The soup was the same as one of the ‘regular’ dishes (the other was Minestrone), but without the cream. S had the same (but with cream). It was very nice, but lacked something (personally, I think it lacked coriander). The thing that really stood out was the depth of pumpkin flavour. 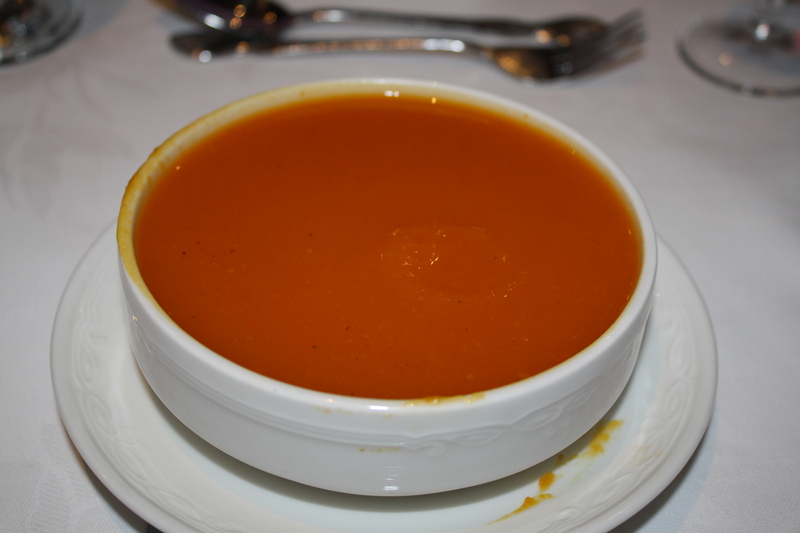 I know that sounds silly, being that it is a pumpkin soup, but it really tasted rich even though it was kind of watery. Now, I don’t particularly mind watery soup, but I think this would have been too much if it was any thicker. S did say that he didn’t think he would be able to finish his bowl, and then did. I didn’t, but not by much. Okay, I’m not really sure what to call this, apart from extremely good. When it first came out, I’ll admit that I did think ‘Here is another stack of vegetables…’ but cutting through the tomato reveled a wonderfully complex warm ‘salad’ type dish. The dessert was a buffet, which looked wonderful, but of course the only thing on it I could eat was fruit salad. S said that the chocolate and orange cake and the chocolate mousse that he had weren’t that good, but I know he was lying for my benefit. 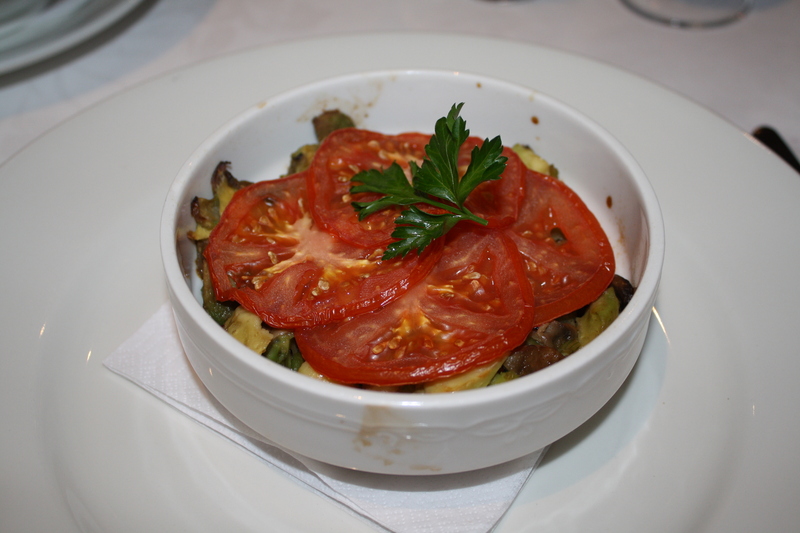 Of course, S had a vegetable lasagna, absolutely swimming in cheese. The day was wonderful, Nat was beautiful and they looked so happy. The food was brilliant, but even if it wasn’t, you don’t really attend your friends’ wedding for the food, do you? I have been inspired by Cutest Food to make watermelon cupcakes, hopefully will have a go tonight. Plus, I’m almost ready to post the new muesli-bar cookie recipe. The photo at the top of this post is of S and me, not Nat and Darren. 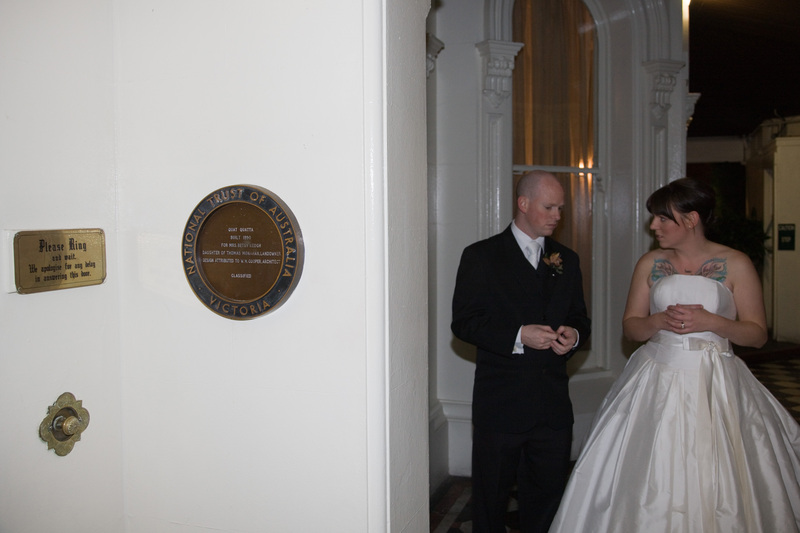 Though I can assure you she was a stunning bride, I didn’t want to post their photo without permission.